You are here: Home / Style & Lifestyle / Body & Mind / Sun confusion! Finally the sun has come out in Luxembourg. After a long grey winter that left many of my patients feeling down in the dumps, and everyone with vitamin D levels in their boots, we can put on our shorts and sun dresses and head to the outdoor swimming pools. Or can we? I am confused. I have just been checking out guidelines on sun safety and those on making sure you get enough sun exposure to boost your vitamin D levels. 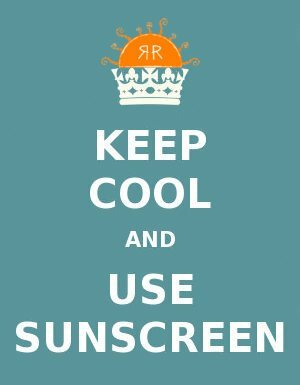 I wanted to write a sensible article combining the two, and give a balanced view point on protecting yourself from skin cancer whilst still enjoying the benefits of the sun. But it is not straightforward. So this is my simple interpretation. Firstly, sunburn is really bad. My Dad’s view, which he still secretly harbours, that you have to go red before you can go brown, is nonsense. Use sunscreen if you are going to be out in strong sun for any length of time. SPF 15 minimum. Reapply regularly and use adequate quantities (which is more than most people use). Seek the shade during the hottest parts of the day and protect your eyes with good sunglasses. Secondly, know your skin. I don’t just mean knowing what your moles look like and reporting any changes to the doctor, although that is really important. I mean recognizing that if you have red hair and freckly skin, you may only need to be outside for a few minutes at 11am before your skin goes red and is burnt. Likewise, you may have dark hair but fair skin and lots of moles, and burn after 15 minutes, or you may have olive skin that rarely burns. Thirdly, know your environment. The worst sunburn I ever had was from hill-walking in Scotland as a teenager. It didn’t feel that hot, but we were at altitude with no shade and skimpy sun tops on. We did put some cream on but too late, and the front of my chest was blistered for 2 weeks afterwards. I also had sun stroke in the tent that afternoon – not much fun. So what about our vitamin D levels? Well, in Luxembourg for sure, there is not enough UV light to make adequate vitamin D in the winter months, so it is important that we boost up our levels in the summer. What the experts recommend is short blasts of sun during the hottest part of the day. And this is where knowing your skin becomes important. One guideline I read advised 10-15 minutes of sun on as much exposed flesh as possible, but I know that today, if I had stood in direct sunlight for 10 minutes at lunchtime, I would be red this evening. However, if you have darker skin, it takes longer for you to make adequate vitamin D, so you need to be out for longer. Be sensible and don’t let yourself get sunburnt. Children need sunlight too without always being covered in factor 50. Let them have short bursts of time outside without protection, but err on the side of putting on the hat and T shirt/sun cream early, rather than letting their delicate skin go pink. Get out of the office at lunchtime and catch a few rays on your way to the sandwich shop. Never use sunbeds- sunbed use at any age has been strongly linked to skin cancer, and many countries have now banned their use in under 18’s. Reach for the fake tan bottle instead. Enjoy the fact that summer is here. Allow the sunshine to lift your spirits, and don’t feel that the sun is always something to be scared of, but treat it, and your skin with respect.